Soon after the Rose Bowl, Gaskin turned his attention toward next week's NFL combine in Indianapolis. He has been training six days a week with several former UW teammates and is eager to perform in front of NFL executives and scouts. He wore his No. 9 Washington uniform for the last time on New Year’s Day, and his Rose Bowl performance that afternoon was vintage Myles Gaskin: 121 yards and two touchdowns on 24 carries. He even threw his first career touchdown pass for the Huskies, whose late comeback fell short in a 28-23 loss to Ohio State. The most productive running back in Husky history, Gaskin rushed for 5,323 yards and 57 touchdowns in his UW career and joined Wisconsin’s Ron Dayne, the 1999 Heisman Trophy winner, as the only backs in NCAA history to rush for 1,200 yards or more in each of their four seasons. Soon after the Rose Bowl, Gaskin turned his attention toward this week’s NFL combine in Indianapolis. He has been training six days a week with several former UW teammates, among others, at Tracy Ford’s Sports Performance in Bellevue, and Gaskin says he’s eager to perform in front of NFL executives and scouts. Gaskin’s older brother, Ivan, recently tried to articulate the approach, the attitude, that carried his younger brother through his wildly successful run at UW. That line of thinking triggered for Ivan a memory back to the spring of 2015, when Myles was a senior at O’Dea High School. The victory earned Myles a place at the top of the awards podium and a customary gold medal around his neck. A few days later, Myles’ parents were surprised to find the gold medal haphazardly lying on the floor in the back seat of their car, discarded and forgotten. “It damn near got thrown out with the trash,” Ivan said. Big brother relayed this as a way to emphasize just how little his little brother cares about anything other than the competition. Myles is a competitor, Ivan will tell you at every turn. At one minute before midnight Nov. 17, Gaskin typed out four words and share them on social media: “I love my life,” he tweeted. It was a moment of reflection a few hours after he had played his final game at Husky Stadium, a 42-23 victory over Oregon State. “Just thinking about everything that’s happened the last four years and thinking about how I was coming into college thinking — I don’t even know what I was thinking (back then). But I wasn’t thinking it would turn out quite like it did,” he recalled last week. “Just feeling real blessed and trying to take advantage of each and every day, like you’re supposed to. Everybody says that, but it’s kind of hard to do. 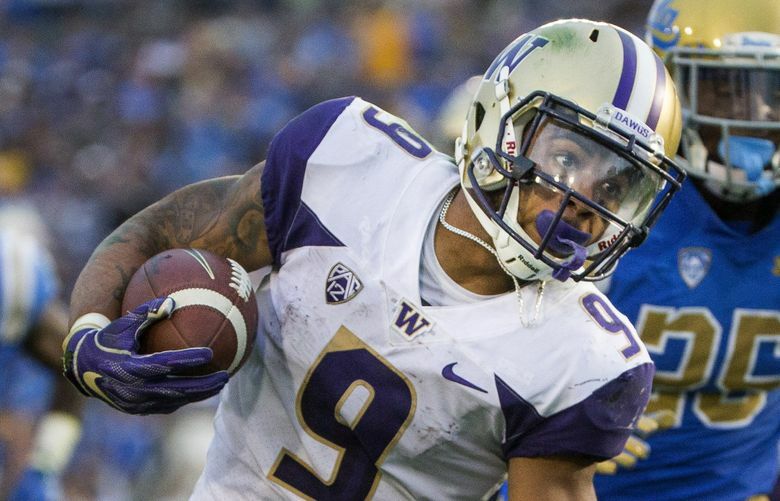 In four seasons as UW’s featured back, Gaskin missed just two games. He carried, caught or returned the football 1,015 times for the Huskies, and even with all his highlights and all his records, his durability might be what’s most impressive. The ailing shoulder that sidelined him for two and a half games last October is “great” now, Gaskin said last week. He doesn’t divulge much about the nature of the injury, but he does say he’s not concerned about what doctors and trainers will find in his shoulder during examinations at the NFL combine. Turns out, Gaskin also played through a shoulder injury for much of his junior season in 2017, when he rushed for 1,380 yards, 21 touchdowns and averaged 6.22 yards per carry, all career highs. Gaskin almost never missed a practice, either. Bhonapha, unprompted, echoed Ivan’s description of Myles’ general approach. Deontae Cooper was a veteran running back when Gaskin arrived at UW in the summer of 2015. Before the season, the Huskies would have their usual early-morning team workouts, and Cooper and Gaskin would then make daily treks to Gas Works Park to run sprints up and down the steep hills in the heat of the afternoon. Gaskin was “constantly beating down my door” wanting to run more, lift more, do more, Cooper said. Most star running backs have down time during a typical week. Coaches often will limit their carries in practices, particularly late in a season. But that down time frustrated Gaskin, who would lament his lack of practice touches to UW punter Race Porter, one of Gaskin’s closest friend going back to their O’Dea days. Gaskin, listed at 5 feet 10 and 193 pounds as a senior last fall, said he was up to 201 pounds last week, and he hopes to weigh in right around 200 in Indianapolis. He ought to be one of the faster running backs at the combine, and he hopes to show he’s stronger than some expect. He recently completed 24 reps of 225 pounds on the bench press, a good amount for a running back of any size. Many analysts have Gaskin projected as a fourth- or fifth-round selection in Aprils’ NFL draft. Gaskin says he’s trying to avoid the speculation. Ben Burr-Kirven, UW’s All-American senior linebacker last fall, has been training with Gaskin over the past six weeks. Burr-Kirven was a standout running back in high school, and he came to UW with Gaskin as part of the 2015 recruiting class. What separates Gaskin? “His patience is elite,” Burr-Kirven said. “He’s obviously a great athlete; he’s fast; he’s explosive; he checks all the boxes, in my opinion. We’ve kind of got the same knocks: ‘He’s a little too short,’ and all that stuff. But he’s the best running back I’ve played against, except maybe (Saquon) Barkley. Maybe Barkley. Those are the guys I see — Myles and Saquon. They’re obviously different type players, but every day the best back we saw all year was Myles Gaskin. The competition begins again in Indianapolis — on-field workouts for running backs are scheduled for Friday — and while the 40-yard dash is an important measurement for NFL prospects, Gaskin doesn’t see that as any sort of finish line for him. “I love the game of football. I love being a teammate,” he said. “And I just want to come in and do whatever I can to play from Day 1. And if it doesn’t work out like that, I’m just going to keep working each and every day.